Your vehicle is equipped with a viscous paper air cleaner filter. It must be replaced when necessary, and should not be cleaned and reused. 1 Remove the four (4) air cleaner cover attaching clips. 2. Wipe the inside of the air cleaner housing with a damp cloth. 3. 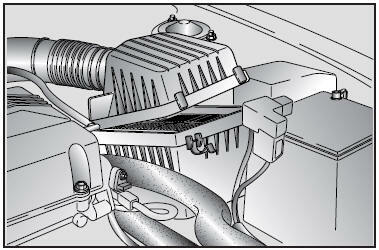 Replace the air cleaner element. 4. Install the cover. Install and tighten the (4) cover attaching clips. Replace the element according to the Scheduled Maintenance Section. • Driving with the air cleaner removed can cause backfiring through the intake and could cause a fire in the engine compartment.